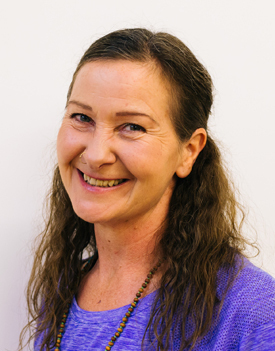 Biography: Angela successfully ran Rodley Yoga Works for several years before uniting with Bridget to form Om Yoga Works. I was first introduced to Yoga in 1995 by my mum. I was working as a croupier in New Zealand when she sent me yoga video. I soon found that with practice my flexibility, balance & strength improved. I found a new sense of calmness, a way to be. The light was surely lit, a new passion found. In 1998 I went to work in the Seychelles and became a student of Dr. Henry Naiken attending yoga classes & one to one Tai Chi, & Qigong sessions, my awareness was expanding. In 2000 I completed a British Wheel of Yoga Foundation Course taught by Vedantananda (Veronica Burningham). Vedantananda introduced me to the teachings of Swami Satyananda Saraswati & this is the tradition of yoga in where my heart lies & my own teachings are rooted. I went on to absorb as many teachings as possible by attending workshops and retreats with Swami Pragyarmurti, Swami Vedantananda, Swami Satyaprakash, Swami Nischalananda & the other inspiring ‘Satyananda’ yoga teachers. In 2002 I went to work back overseas. During this time some of my work mates were curious about my practices & I started to share my knowledge & nervously taught some classes which were immensely enjoyed & hugely beneficial. In 2005 I came home & was accepted on the Teacher Training Course at Mandala Yoga Ashram in Wales. I was blessedly tutored under the guidance of Swami Nischalananda Saraswati. The 2 year course is fully accredited with the British Wheel of Yoga. Since embarking on my teacher training course my classes have organically grown and now along with Bhavani I am able to help create a dedicated sacred space for our practice of yoga, the home of Om Yoga works. I have been given the spiritual name of Vigyana by Swami Nishchalananda, Vigyana means Insight & therefore the name is to remind me to be ever open to insight. Call Angela on 07786 255 211, email me or connect via our contact form.